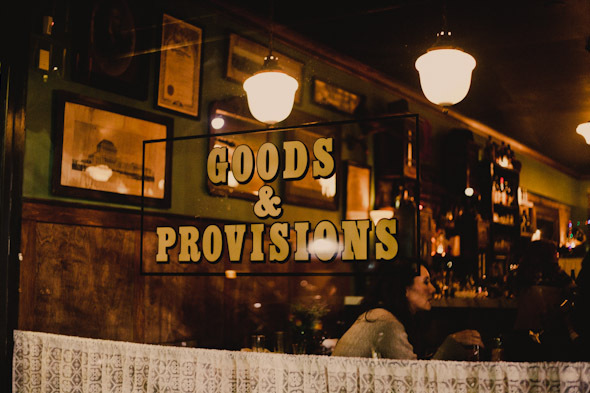 Goods and Provisions is a well-kept secret in the heart of Leslieville -- our very own Prohibition-era speakeasy, complete with dim, globe-lit corners and black-and-white tiled floors. 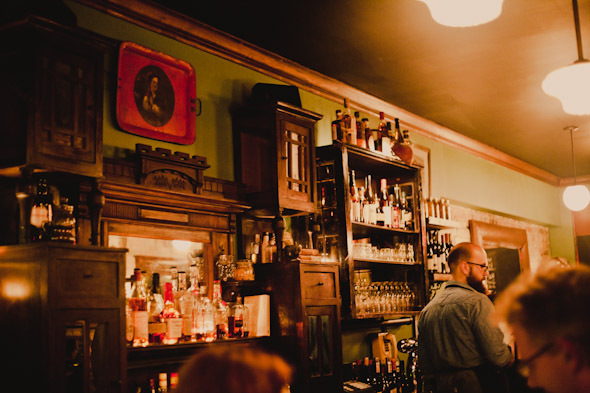 Dark stained oak paneling, sepia photographs, heavy wood tables and ancient misty mirrors complete the effect that we've fallen into a cozy 1930's tavern. 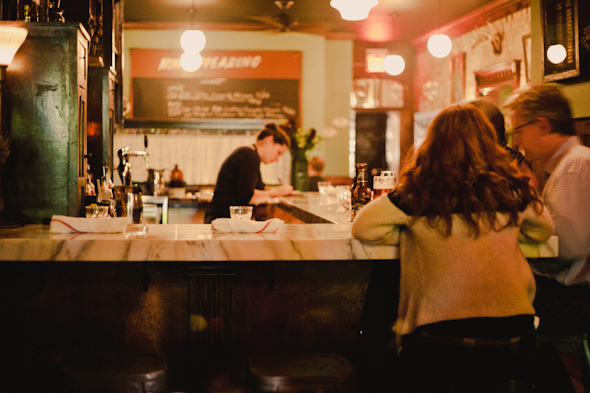 A pheasant presides over the sleek marble bar and deer antlers are mounted on a side wall, an aesthetic touch as requisite and necessary as the bearded, bespectacled bartender in any gastropub worth its weight on Queen Street. 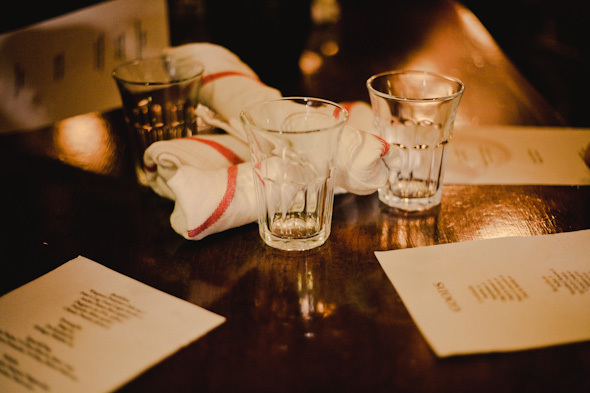 While the interior had us expecting traditional pub fare, the menu selection was simple and refined, including: Duck rillette with daily dressings and toast; oysters, bone-marrow with parsley salad and a terrine board. Our waitress seemed so delighted to inform us of the daily offerings that even the house salad sounded irresistible: radicchio, shaved carrot, caramelized shallots with a champagne dressing. 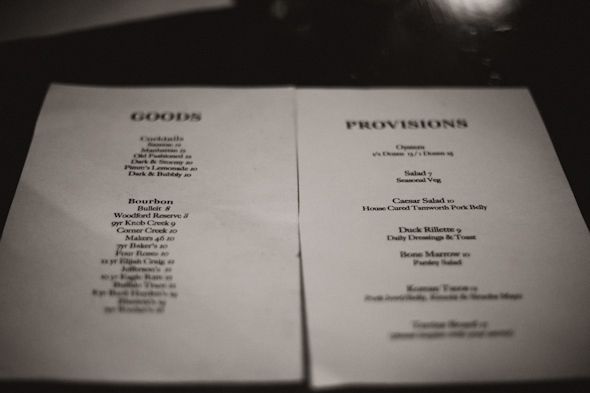 We finally settle on Korean tacos, duck-fat fries, wilted greens, and Caesar salad with house-cured pork belly. To drink, we had a snappy and not-too-sweet ginger beer, although "provisions" abound, from Nova Scotia beers to a variegated listing of cocktails. 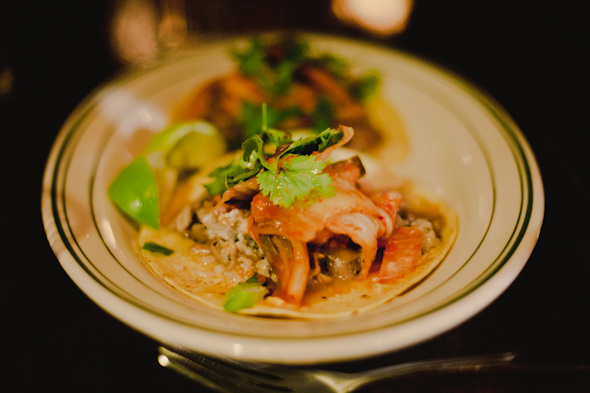 The tacos (12$) were two mountains piled with bright red Kim Chi, fresh cilantro, pork jowls and belly garnished with lime. The sheer cultural collision of cornmeal and spicy cabbage, chewy pork and peppy lime put a whole new slant on North American immigration laws for me: There is nothing wrong with multiculturalism. Deep-fried in duck-fat and served with a slightly spicy mayo, these fries (6$) should be Toronto's new poster-boy for comfort food. Sorry Smokes. The tongue chemistry of crisp, salty and fatty was simple, but so well done, that for this dish alone, I will gladly bundle up in -20 degree weather and walk the two kilometers from my doorstep to 1124 Queen Street East. The wilted greens (6$) strategically appear on the menu just underneath those fries - a healthy, emerald swag of saintly Swiss chard, to redeem us from the devilish duck-fat. The sweet, fresh chard was garnished with lime, and serves as a nice counterpoint to the lightly greasy fries. Haven't you ever prayed that a large, healthy salad would balance out an equally large slice of cheesecake? 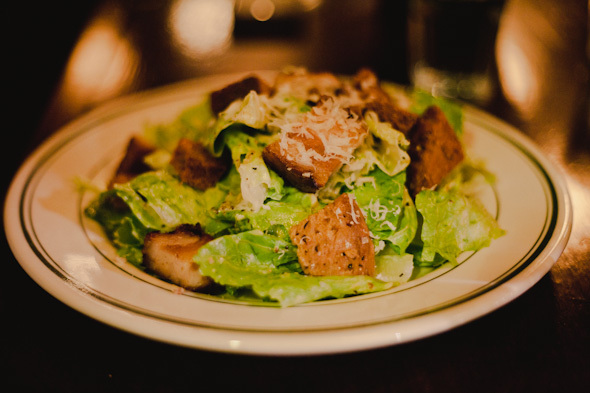 The Caesar salad (10$) was fairly standard, though studded with particularly crispy, dark, croutons which (not surprisingly) also seemed to have joined the animal-fat party. What made this dish unique however, were the frizzled fatty bits of pork belly, an unexpected salty counterpoint to the crisp romaine and crunchy croutons. 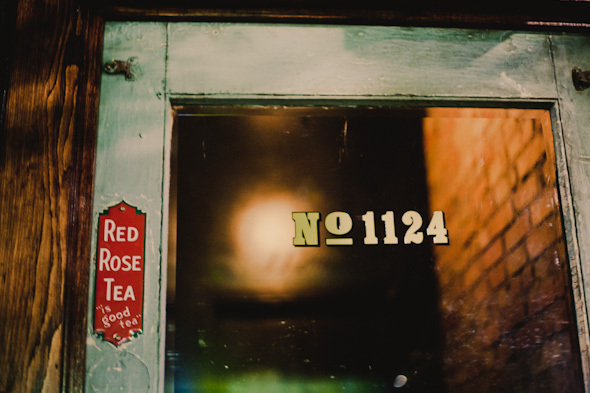 Once again, we had the sensation of one foot firmly planted safely in a Canadian tavern, and the other shanghaied into gastro-heaven. The single dessert on the menu was so simply named "Chocolate: vanilla whipped cream" ($7), that it piqued our curiosity. 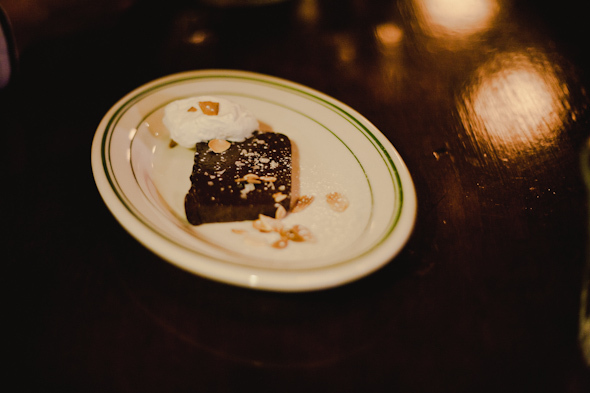 A small but promisingly-rich looking slice of chocolate terrine arrived, with a daub of whipped cream and a scattering of coarse salt. This is how chocolate should always taste. Cocoa-y, deep, dark and silky, played against the chunks of salt and sweet cream, flavored simply with vanilla. This was a satisfying finish to an honest meal in what is sure to become a neighborhood hub.